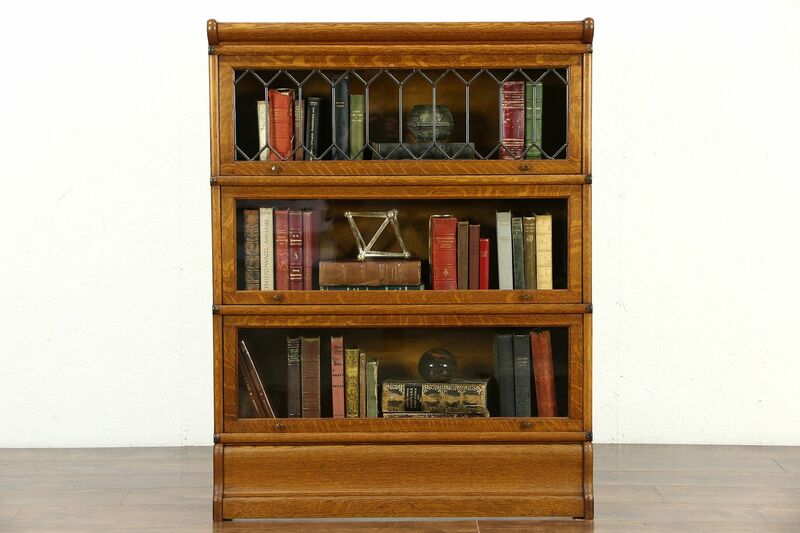 A three stack "lawyer's" bookcase is signed by famous maker "Wernicke of Grand Rapids, Michigan," with the latest patent date "1897." Quarter sawn oak retains its original finish with later repolishing that is in very fine condition with a little "crazing" to show its age. The upper door has a later hand leaded glass window, lower glass is original and wavy on this American made antique library furniture. The base and top are also separate stacking modules. Books up to 8" wide and 9 1/2" tall fit. Coppery fittings are original. A later merger resulted in the prominent maker, Globe Wernicke. Size is 34" wide, 11" deep and 45" tall.